Rickey Henderson set a new standard for stealing bases, eventually becoming the all-time stolen base king. His famously unique personality also made him a favorite among the many teams he played for over his quarter-century career. 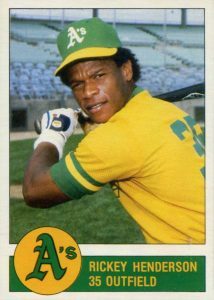 In this list of the best Rickey Henderson baseball cards, you will find his popular rookie card as well as his other key cards from the early 1980s. Shop for Professionally Graded Rickey Henderson cards on eBay. 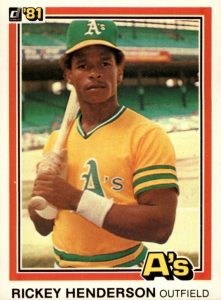 Henderson signed with the Oakland A's directly out of high school in 1976 and debuted in their outfield in 1979. No other batter in major league history could lead off a game like Rickey. He could draw a walk (he's the all-time leader in unintentional walks) or simply hit a lead-off home run (he's the MLB leader in that category as well). After Henderson got on base was when he really showed his value to the team. In his first full season, he overtook Ty Cobb's American League single-season stolen base record. In doing so, he became the first and only American League player to ever surpass 100 stolen bases in a season, which he would do three times in his career. 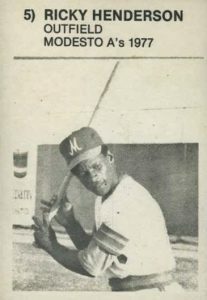 Two seasons later, Henderson would break Lou Brock's all-time single-season record with 130 steals, making him the unquestioned king of stolen bases and earning the nickname "The Man of Steal." Over the course of his career, Rickey Henderson was frequently in the mix for MVP voting and he came out on top in 1990, earning the Most Valuable Player award with the A's as he led the league in runs, stolen bases, and on-base percentage, while also adding 28 home runs. Henderson would go on to become the all-time leader in runs scored, joining the 3,000-hit club while with the San Diego Padres in 2001. He ultimately finished his career with 3,055 hits, nicely complimenting his record of 2,295 runs scored. Henderson was elected on his first ballot to the Hall of Fame in 2009 with Boston Red Sox slugger Jim Rice. Transitioning over to his card options, Rickey Henderson has plenty to collect and many more are notable than can be narrowed to just ten choices. One such example came early in his career. When the Fleer card company was producing tests for their 1982 set, they created cards of their new design. Some of the test cards reached the secondary market and one of these cards include a picture of A's pitcher Mike Norris while the name reads "Rickey Henderson." This error card is far too rare to include it in this top list but it is an interesting cardboard oddity. In both 1991 and 1992 Donruss, Henderson was included in the Elite insert set that has proven to include some of the most valuable cards from the over-production era. His 1991 appearance was limited to 10,000 copies, and his 1992 card has an even smaller availability at 7,500 copies. In 1991 Upper Deck, collectors can find one of the most unique Rickey Henderson cards. Upper Deck combined three Henderson images on a single card, giving it the look that he was in motion on the card. Another card from the same set honors Rickey's passing of Lou Brock's all-time steal record. It shows both men embracing a base with "939" inscribed on it. 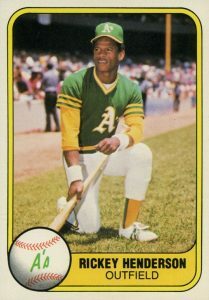 Rickey Henderson played for nine teams over his 25 seasons, making him a popular player among a large group of fans and resulting in a large amount of cardboard. In building this top list, card design, collector demand, and card value was all considered. Henderson has two cards in the premiere Fleer set from 1981 that appear to feature photographs that were taken just seconds apart. His standard base card #574 is on the left and another card honoring his breaking of Ty Cobb's American League stolen base record is on the right (#351). In total, Henderson led the league in stolen bases 12 times over his career. Although the 1981 Donruss set is notorious for its printing errors in the early series of cards, Henderson's Donruss card escaped error-free. Printing variations also create difficulties in finding highly-graded, perfectly-centered versions of the card which features him in his A's home jersey. 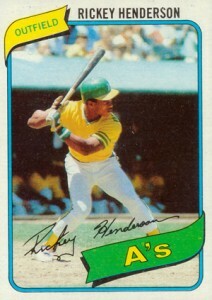 Although Henderson bounced around to nine different teams, he spent 14 of his 25 seasons with the A's. Topps made gold-stamped 1991 Topps cards for soldiers in the Desert Shield military operation and many of those cards have made their way to the secondary market. The production run was 6,800 complete sets, creating a very limited run of cards when cards were widely over-produced. Henderson's card is one of the most beautiful in the set as it is positioned horizontally. The photograph seems to show Rickey diving back to first base as a first baseman's glove tries to catch him. A rare early card for Rickey Henderson could be found in bags of Granny Goose Potato Chips, an Oakland-based food company, during 1982. There are 15 A's featured in this team set that uses the identical design that was used in their 1981 promotional set and the cards are numbered based on the player's uniform number. Collectors can tell the difference between the two sets by the copyright year on the reverse side of the cards. Changes were afoot in 1981 Kellogg's 3-D as the checklist expanded to 66 cards and the cards themselves were expanded to the typical 2 1/2" x 3 1/2" measurements. Over time, this larger size has proven to help with the cracking problem that the earlier Kellogg's sets would run into. 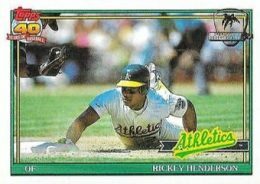 Henderson fans weren't able to pull Rickey's card from cereal packs as the cards from this set were available exclusively through a mail-in offer on the cereal boxes. Given the fact that his Topps rookie is so iconic and valuable (more on that later), collectors on a budget can turn to his second appearance in 1981 Topps for a key early Henderson card. The 1980 season would be Rickey's first as the stolen base leader and he would also lead the league in getting caught stealing. In fact, Henderson holds the record for failed stolen base attempts with 335 over his career. 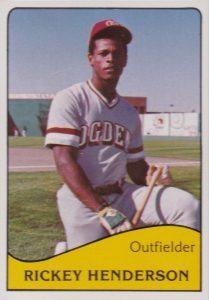 The fist of two pre-rookie cards to make the list features Rickey playing with the Ogden A's, the franchise's AAA affiliate. The reverse side is pretty simplistic as it provides basic physical information and no performance statistics. TCMA produced many sets for minor league teams over the years and Rickey's card is one of the most valuable they ever produced. 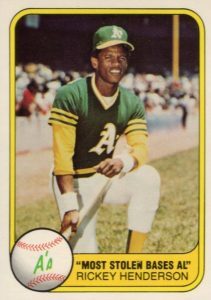 The very first Rickey Henderson baseball card as a professional player can be found in a small release honoring players on the Modesto A's minor league team. 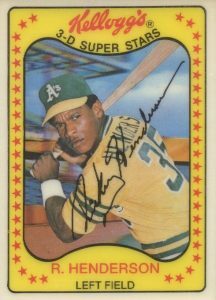 There were 22 cards in the set and Rickey's card features a typo in his first name as it was spelled "Ricky." That is not a great way to start off your baseball card career! Collectors looking to track one of these cards down should be aware that it has been reprinted many times, including by the original issuer, Chong Enterprises, so you should stick to authenticated versions. 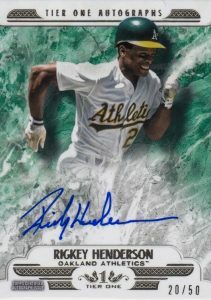 For autograph collectors, obtaining an on-card Rickey Henderson autograph can be a difficult task. He was only included in a handful of certified autograph appearances during his playing days, with none of them being hard-signed autographs. Oakland A's fans would have to wait for new releases that would feature Henderson in an A's uniform and even those recent appearances have been in limited quantities. I would recommend looking to the Tier One series from Topps that has regularly featured on-card Henderson autographs, including this example below from 2016. 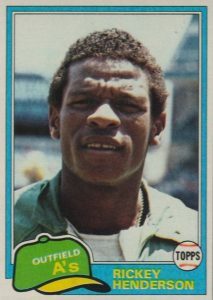 It is rare that one single card can come to dominate a set, but that is the case with the Rickey Henderson rookie card from 1980 Topps. It is so far ahead of every other rookie and star card in the set in terms of value, you would think it is Rickey on the base paths. The beautifully framed card with Rickey's famous autograph across his feet can approach $500 at auction for mint copies. 1980 Topps Rickey Henderson #482 Quick Ship! 2011 TOPPS TOP SHELF RELIC #26 RICKEY HENDERSON YANKEE BAT 250 399 UNCIRCULATED! Very very very nice write up! I’ve been a fan of his since 1985 and collected every card of his… Except the Madesto one. But it’s time to sell all my stuff – no kids to pass them down to.